The Australian livestock industry today possesses unacceptably high levels of fatalities and injuries. Farms present several hazards but many incidents can be avoided by implementing safe work practices. 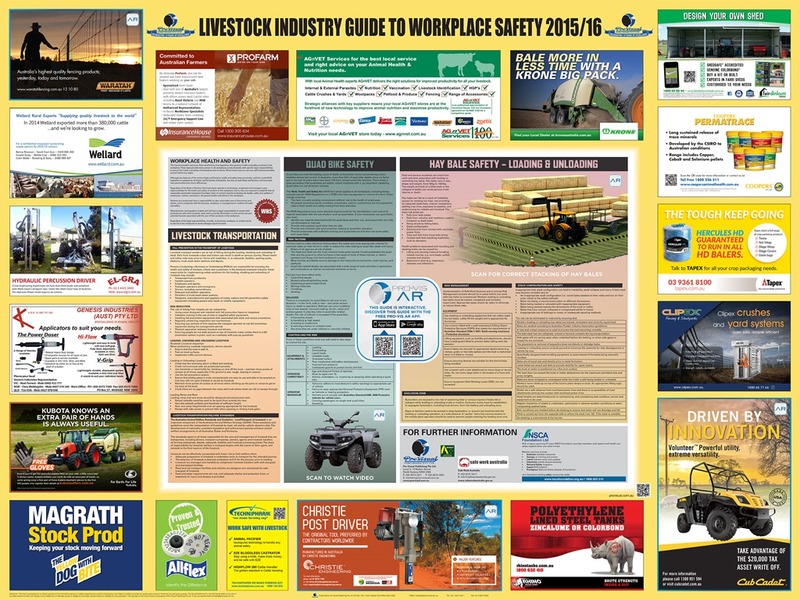 Safety doesn’t hurt, which is why Pro-Visual Publishing, in collaboration with the National Safety Council of Australia Foundation (NSCA) and Safe Work Australia, has released the Livestock Industry Guide to Workplace Safety 2015/16, with augmented reality (AR) capabilities. Using the Pro-Vis AR app on smart phones or tablets, farmers working in the livestock industry can unlock hidden content and engage with the most up-to-date safety information. Livestock workers face a number of risks each day. It is the responsibility of employers to always keep in mind the safety of their workers and the welfare of their livestock, and ensure proper measures are in place to reduce those risks. There are a number of risks associated with the use of quad bikes on Australian farms and for this reason quad bikes are now the leading cause of death in the livestock industry. The guide uses AR to emphasise the importance of quad bike safety. Fatal accidents are not only the result of unsafe quad bike use. Hay bales, if stacked incorrectly, can topple over, severely injuring and, in worst cases, killing workers or bystanders. Management strategies that reduce or eliminate the risks associated with hay bale configuration must be adopted. AR brings the risk of fatality to life. Safety should always be a number one priority on livestock farms. – John Hutchings, CEO, Pro-Visual Publishing. Pro-Visual Publishing is the leading specialist in wall-mounted workplace health & safety, food safety & hygiene, and wellbeing information resource Guides. Each Guide is practical and informative, providing a quick reference point for management and staff, and designed to inform, motivate, educate and above all keep people and their workplaces safe!